In the year 1819, Colombia and Venezuela were both fighting a war against the Spanish to secure independence. Venezuela was deep in the middle of a civil war, but in Colombia, or New Granada, as it was called, the Spanish had gained were in a time of relative peace, due to the iron-fisted government of Viceroy Juan José de Sámano, who took orders from the Spanish. Due to its time of peace, Bogota, the capitol of New Granada, was undefended against outsiders. Simon Bolivar, who was at war in Venezuela, was eager to help liberate Colombia, and decided to leave Venezuela to attack Bogota. The only problem was that the Andes divided the two regions. Nonetheless, Bolivar led his men over the pass through the mountains, which was over 13,000 feet about see level. The snow, winds, and ravines were so dangerous, Bolivar lost a third of his men in the crossing, but by early July, Bolivar had made his way to New Granada and the Spanish had no idea he was there. Bolivar was quick to regroup his men, and many Colombian nationals were eager to join him in his march towards Bogota. On July 25th, Bolivar led his men against the Spanish forces under General José María Barreiro at Vargas Swamp. Though the battle was a draw, the battle showed Barreiro that Bolivar was a force to be reckoned with. He also discovered that Bolivar was headed for Bogota. On August 7th, 1819, as Bolivar regrouped and headed for Bogota, Barreiro rushed to cut him off. 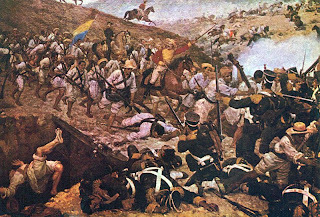 Barreiro sent his elite warriors, the vanguard, ahead to the bridge of the Boyacá River to keep Bolivar occupied until the main army arrived. Bolivar, however, was closer than expected. The vangaurd reached the bridge, where they waited for the rest of the Spanish army to arrive. Bolivar, however, arrived first. Bolivar sent a small group of his men, led by General Francisco de Paula Santander, to engage the vanguard while Bolivar went back for Barreiro. Bolivar surrounded Barreiro and his forces and then attacked. Barreiro, who realized he was surrounded and seperated from his best soldiers, quickly surrendered. Hearing news of Bolivar's smashing victory, many Spanish royalists, including Bogota's Viceroy Juan José de Sámano, fled the city. Several days later, Bogota was captured and Colombia had gained its independence from Spain. 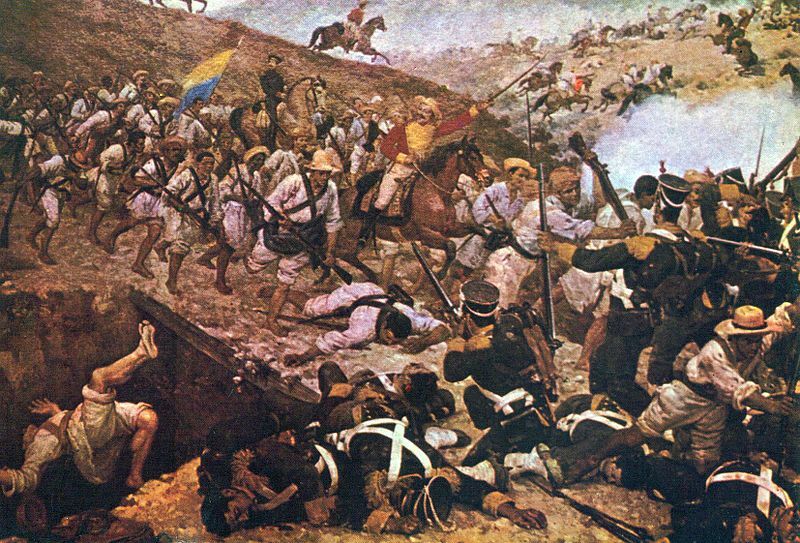 The Battle of Boyacá is now considered to be the the battle in which Colombia gained its independence.